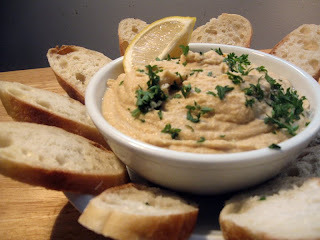 I used to make hummus all the time years ago. And it appears my culinary skills have vastly improved as this was the most tasty hummus I have ever made. 1. In a blender or food processor, combine 1 can of cooked chickpeas, tahini pasta, crushed garlic cloves, olive oil, lemon juice and zest, and salt and pepper. 2. Blend until smooth. Add extra water if needed. 3. Serve with baguette or pita or chips. Sprinkle with some chopped parsley if you want to make it look fancy.